My word of the year is whispering to me everywhere I go. I chose the word “courage” this year, as I have quite a few goals I intend to reach, but I need an extra double shot of “courage” to put myself out there. You can read my post about this here. So, in an effort to work through my fears, I joined the Life Book 2013 group. Last week, I began to work on my first art journal page assignment from Tam. Our assignment was to create our own fairy art mother who chases away our inner critics in order for us to create with freedom. 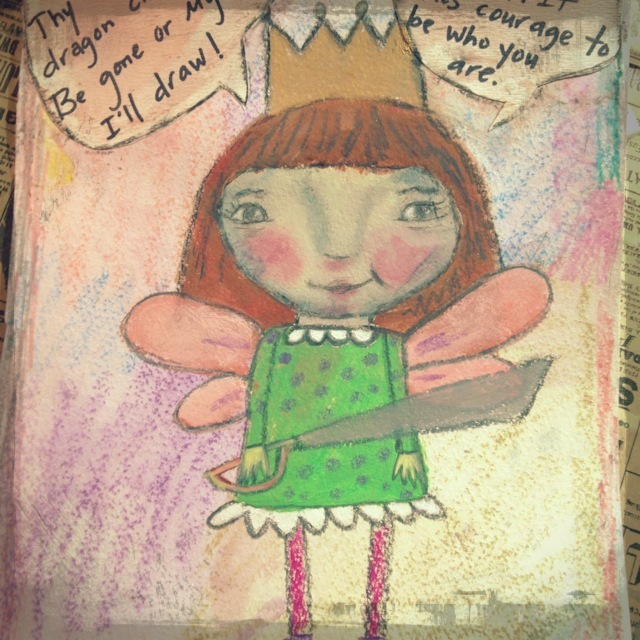 Our fairy art mother would shoo away that nasty voice we hear about our work not being good enough. I even added a sword! I don’t know why, but I guess I was thinking that those wretched voices are like dragons and I could ward them off with a sword. Crazy. I’m also rereading The Artist’s Way by Julia Cameron and this caused me to join a fabulous face book group of ladies who are also reading the book. We are sharing our artist date experiences and I am so inspired by the experiences I read. So, today I decided to take myself out on my artist date. Restock the well. Explore. Open up all my senses. I decided to do some browsing in an old used bookstore we have downtown. It’s actually more like a used “everything” store, but it started out with just books. I walk in the door and right there I see her. On a tall glass shelf at eye level. Looking at me. I am drawn to her and my mouth drops. She even had the sword. I snatched her up and felt like I’d discovered gold. A giddiness inside was just bubbling. My mind was on monkey overdrive. I paid 5.00 for her at the till. (Well, not right away really. I browsed the entire store and also found an armful of books at a dollar each.) The clerk gently wrapped her in newspaper and told me to carry the bag carefully. Defending our earth and it’s inhabitants. A protector she is. And then, I realized. . . this faerie guardian is within me. Not only am I the protector of my artist self, but I am also the protector of much more than that. I am responsible for the protection of my health, my dreams, my goals, in my beliefs and passions. No one is responsible for all of this but me. It’s my duty to hold myself accountable to it all and protect the “me” that is to be. Whatever evolves will evolve and it will be good. As long and I am courageous and can draw my sword when that inner voice starts whining, or criticizing, or worse. I have a fairy art mother and a faerie guardian now. I love this post! And now I want a fairy art mother! Courage indeed! I love this so much! Fairies have a way of surprising us…a way of delivering messages from the Universe that we need to know. I love your Fairy Art Mother…paper and statue forms! With that sword, you can do anything! Wow! Eyes wide open! I might have missed that fairy girl but I will be watching out for mine now. It will sit as a reminder of ll you said here! Inspirational stuff. Totally true, Jean. On Artist dates, you tend to be more aware because you are taking in all your surroundings with all your senses. Most of the time, we just sail through life, don’t we? Without noticing. . .
i love this – i believe everything you are doing is making your eyes wide open – you are open to receive what might have been around you all the time. Thank you, Vickie. It’s easy to “not see”. But, when one is aware of all the messages around you, you begin to live more wide awake. 🙂 Thank you so much for taking time to read my post. I love this gorgeously written post. So glad I found your blog through the Artist Way Group, I will happily follow along. This post is very magical, and the synchronicity of that find in the old bookshop is such an obvious sign that you are really ON to something and connected to what’s true for you. And that lovely protective statue looks like you too ! At least the image I can see posted on your FB page. Wishing you the best of luck against the nasty inner judge, but sounds like you are ready to do battle now ! Thank you so much for you kind comments, Andrea! Your words are such that carry me through and give me the nudge to continue to write for others. Blessings you you. . .
AMAZING and what a gift you have found. This year with your swords protecting the all encompassing you that you are, you have nothing to fear! Be brave beautiful friend! I have goose bumps Shari! What a great experience and message for you. I love the way the universe works. Shari…what an inspiring and empowering story…love it and your writing! 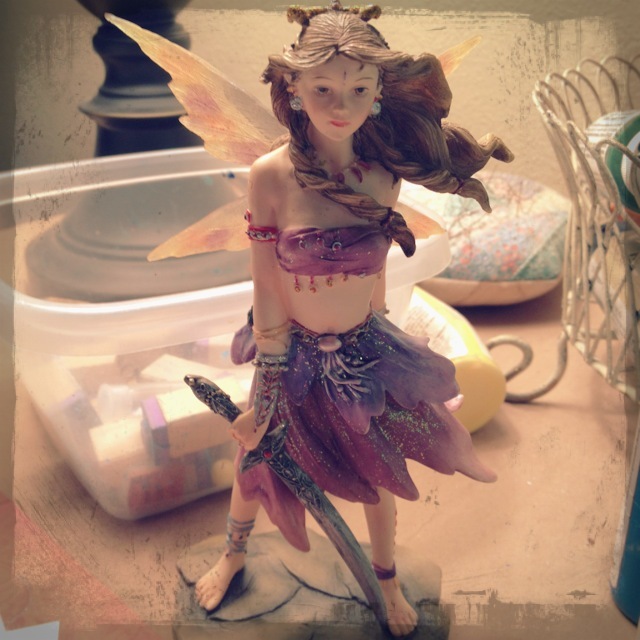 I’m gonna adopt this sword brandishing fairy guardian in my mind when the Censor appears…awesome:)) You go girl! So much of what we are searching for is actually within ourselves, isn’t it, Janine? It seems like every time I need an answer for something, if I can take it to paper, it appears. Or, if I can quiet my mind to be aware of the signs, it appears. God works in mysterious ways. . . This is soooooo true! I’m rereading it for the 3rd time and every read is a new experience. Shari ~ I love that your fairy has that sword and then you saw her! I also of course love that she was $5 and in a wonderful used book store too! Thank you for sharing that adventure! I was thinking my artist dates would have to hold… but now that I think of it there have been two times recently that I stopped at a local resale shop real fast and had so much fun. It is fast, cheap and close…and I got a candle one time and a round glass hen too and I have been looking for one (that I like) forever! There is a book there that I want next so I think those will be my dates. Thank you for sharing and inspiring… you certainly had a magical experience! Yes, it was very magical, Karrlin! I think old used anything stores are so much fun when you go into them with a wide open lens and not looking for anything in particular. Just be totally curious. Make sure you let us know what happens in your used book store. Miracles happen in the strangest places! Oh my God, what a fabulous Artist Date you have had! …the finding of that statue is truly amazing and she is so beautiful just like you. I love how you tied together a few of your creative paths in this blog post: the protector, the e-course, the support group and your WoTY. So happy I came by for a visit and a vista!